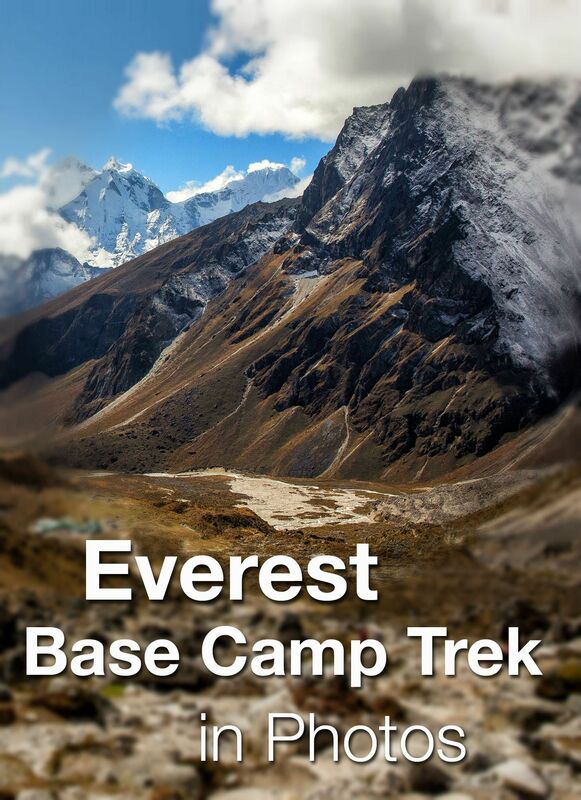 The Everest Base Camp Trek takes those willing to do it through some of the most gorgeous terrain in the world. 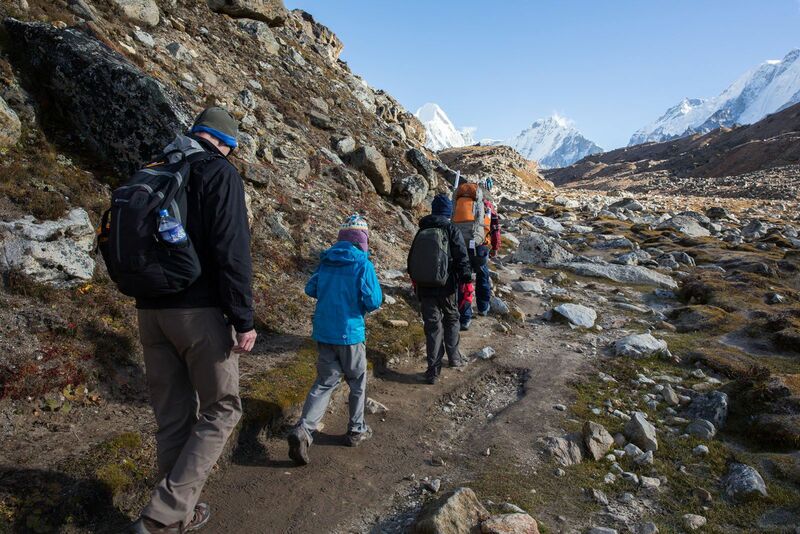 While trekking, ascending hundreds of meters every day, fighting for oxygen, and dealing with fatigue and the symptoms of early altitude sickness, it was difficult to appreciate the true beauty of the trek. 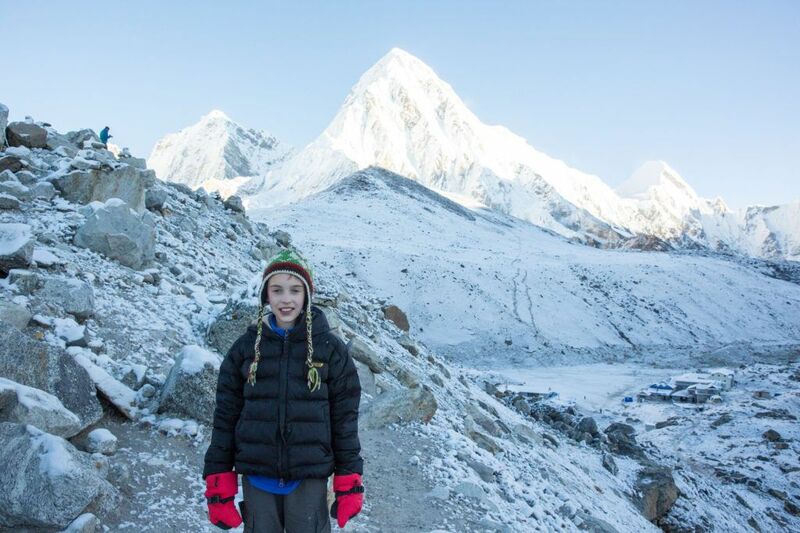 Yes, we were amazed at the snowcapped Himalayas towering over our heads, the prayer flags flapping in the wind, the crystal blue skies dotted with white puffy clouds. It was breathtaking in more ways than one. But, now that we are home, these photos from the trek are amazing gifts, proof that we really walked this epic trail through the Himalayas. How could we not share them with you? 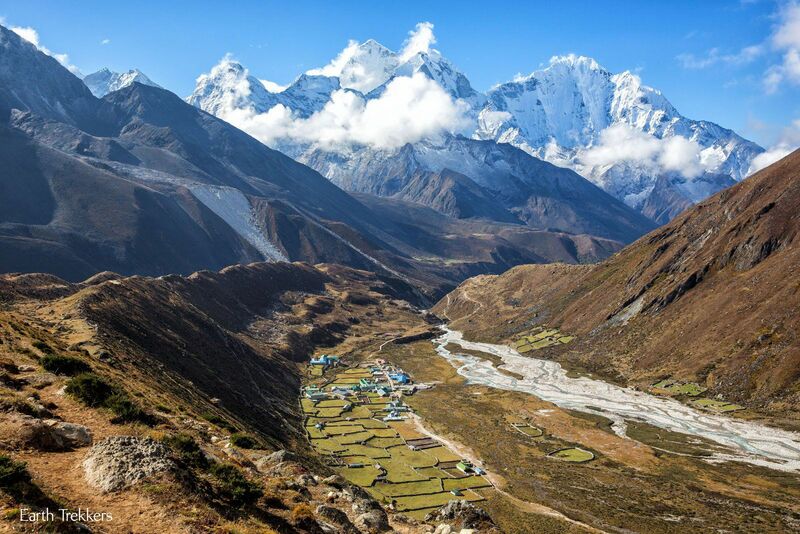 Here are the Himalayas in Nepal…one of the most breathtaking places we have been. On the first day of the trek, hiking between Lukla and Phakding, we walked amidst misty mountains. It was late September and the monsoon season was lingering a little longer than normal. With that came overcast skies and the threat of rain. Each small village had a collection of prayer wheels and prayer flags, evidence of the numbers of people who practice Buddhism in Nepal. 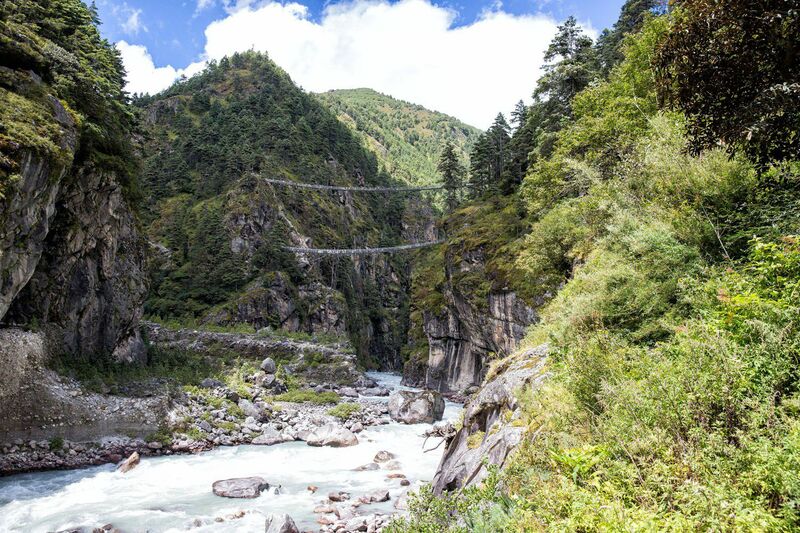 Those who have watched the 2015 Everest movie will recognize these suspension bridges. It is the higher of the two bridges that is open for business, carrying trekkers over the “milk river.” From the end of the bridge, it was one final climb to Namche Bazaar. 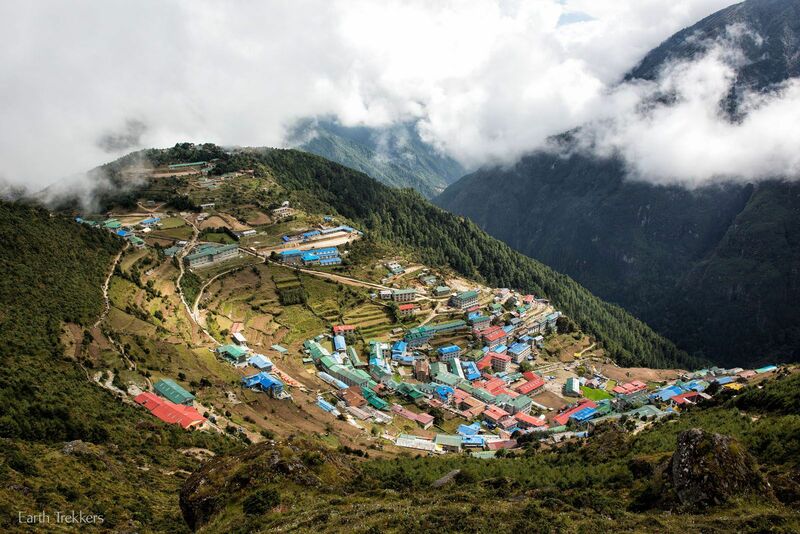 This is the view over Namche Bazaar from our acclimatization hike. 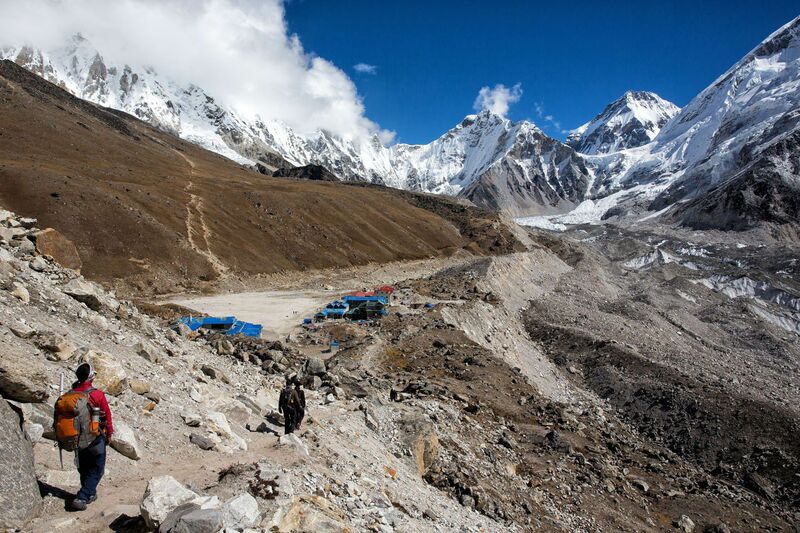 From here, the terrain changes, and for the remainder of the Everest Base Camp trek, we would be hiking in the shadow of the Himalayas. 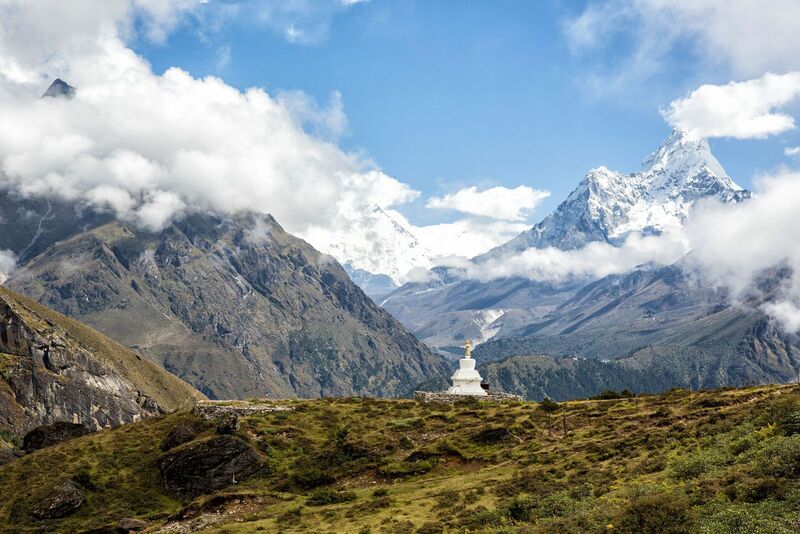 Continuing our journey north…a chorten (also known as a stupa) and the Himalayas stretching out beyond it. Yes, Everest is there, just hiding behind the clouds. 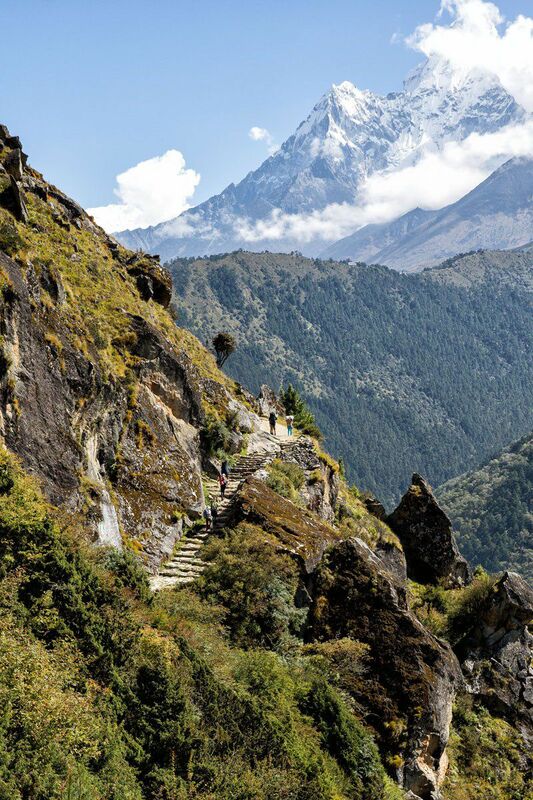 We walked on seemingly endless rocky paths along the edge of mountains, climbing stone steps, dodging yaks and porters on the trail, feeling so small and insignificant in the company of these mountains. 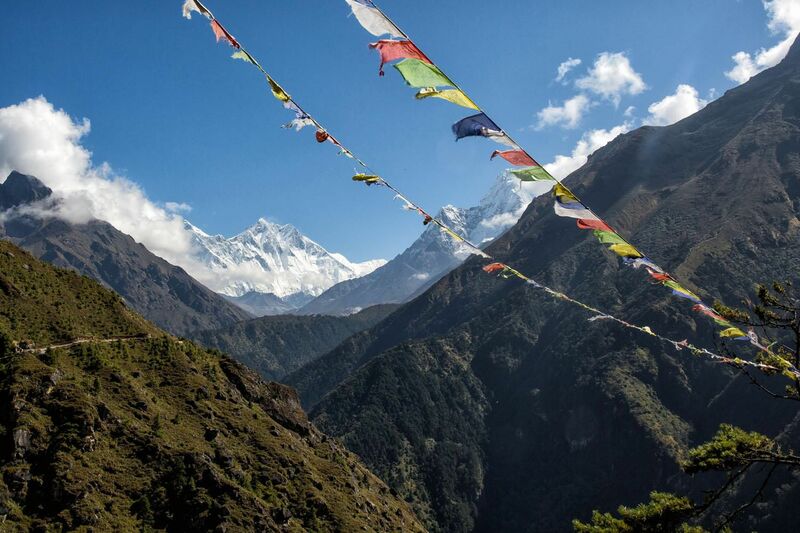 Prayer flags, the trail, and Everest just barely hidden behind the clouds. 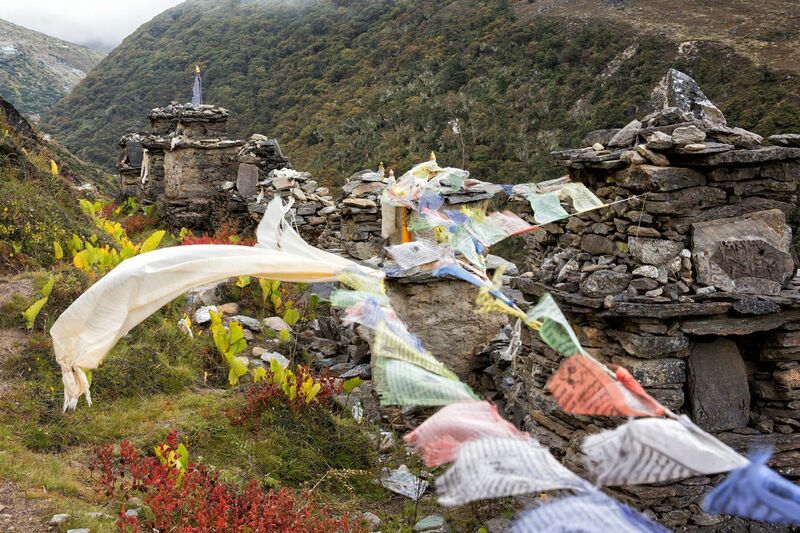 More prayer flags and chortens along the trail. 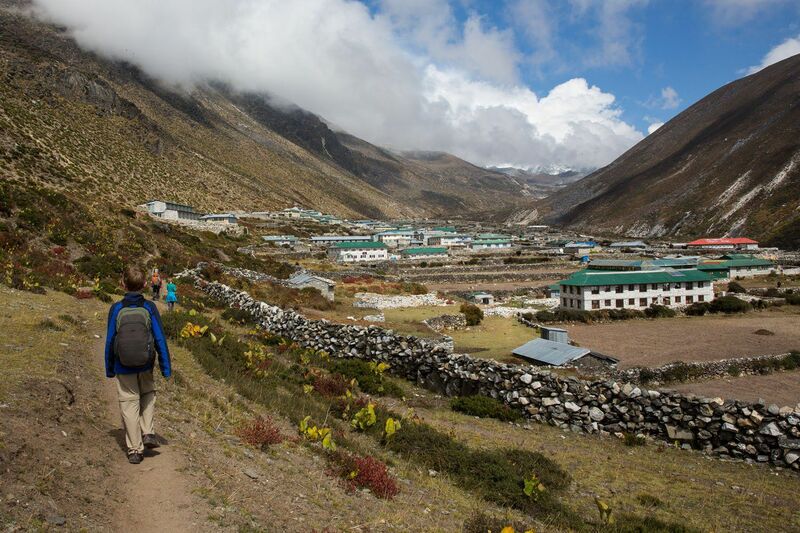 Now we have left Dingboche behind and are trekking towards Lobuche. The views just keep getting better everyday. Down in the valley is the town of Pheriche. 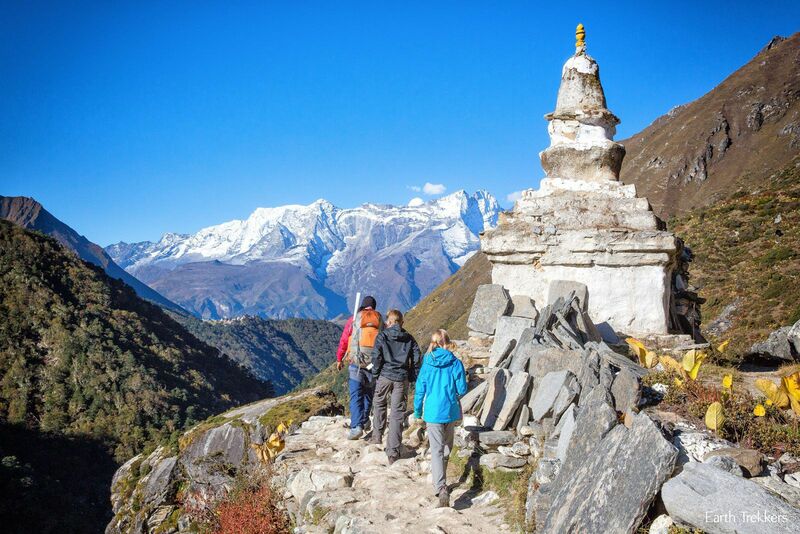 We would hike through Pheriche during our return trip back to Lukla. Just past Pheriche we had a small but difficult climb. From here the landscape changed dramatically. 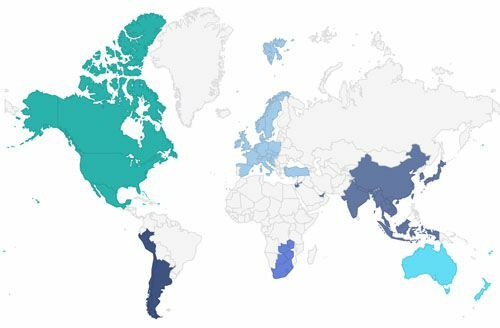 Say goodbye to almost anything green that was growing. Now we were hiking among boulders, scraggly bushes, and soon, a glacier. From here we were just a few kilometers from Lobuche. 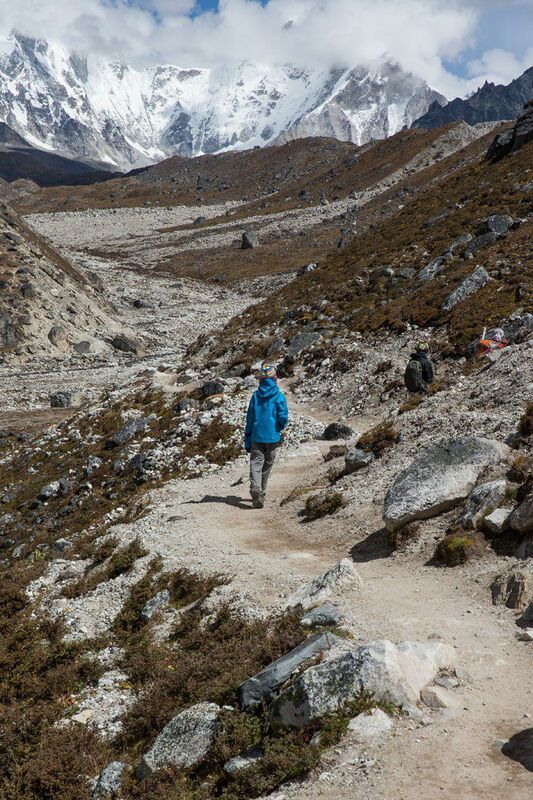 Another view of the trail connecting Dingboche to Lobuche. It looks almost flat…it was crazy how difficult it was to catch our breath here! 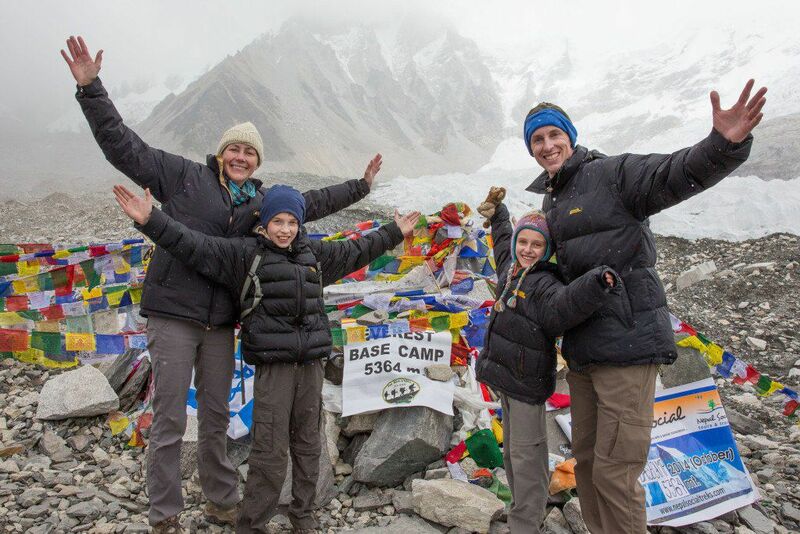 The final day to Everest Base Camp. The buildings with the blue roofs make up the tiny town of Gorak Shep. 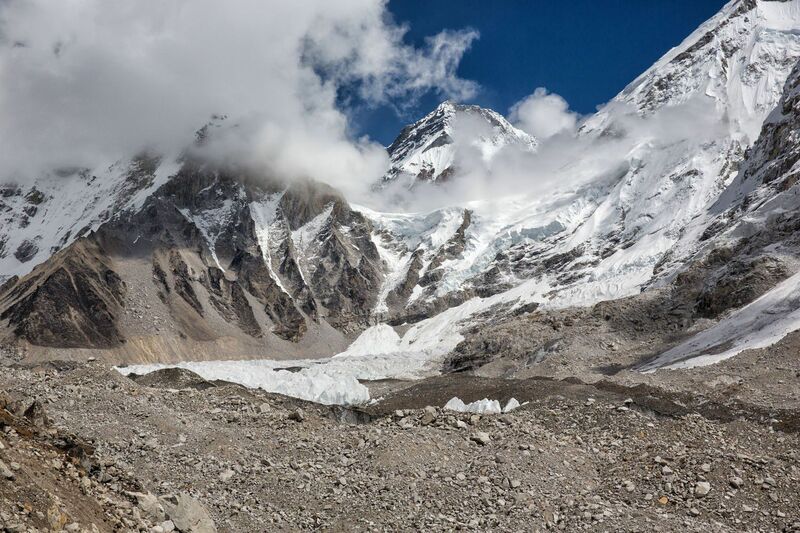 Just beyond it sits Everest Base Camp, with the comma shaped mounds of snow and ice that make up the bottom of the Khumbu Icefall. Everest looms off the right side of the photo. We were now so close to it that we could not see the summit anymore, since it was hidden behind Nuptse. 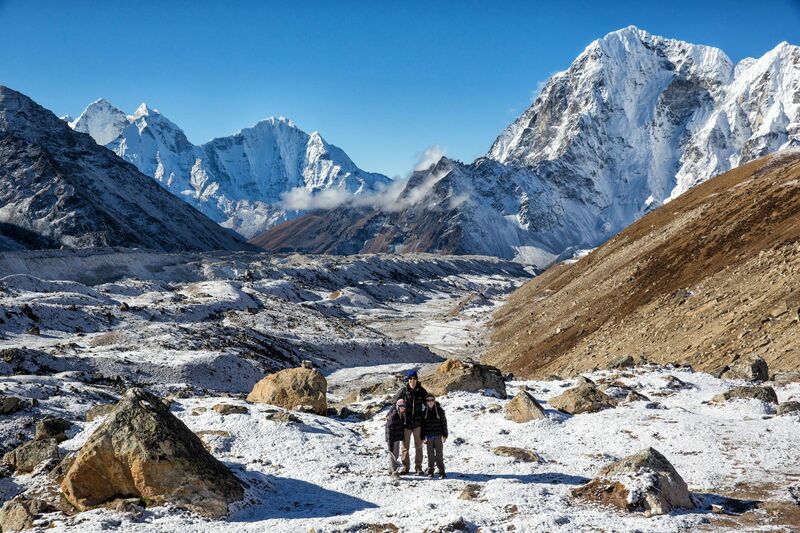 On our way to Everest Base Camp from Gorak Shep. 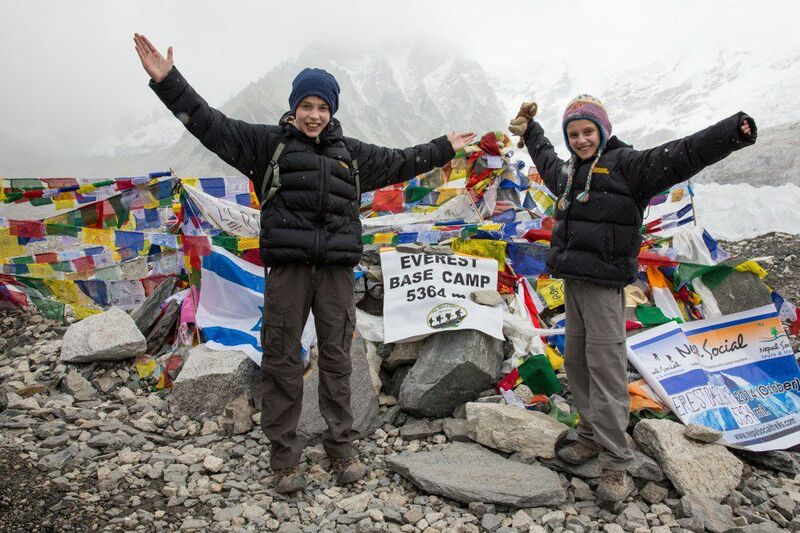 It takes several strenuous hours to get to base camp even though it is only a few kilometers away. At this point, walking on level ground had us struggling to breathe…5164 meters, 17,000 feet. 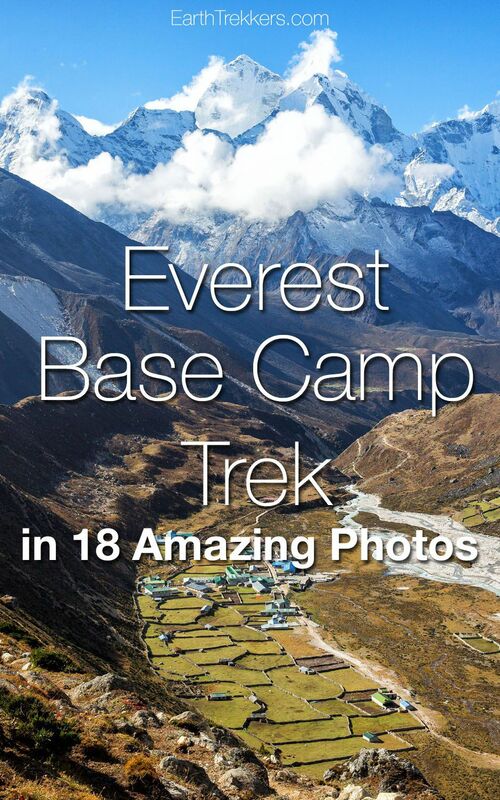 A closer shot of Everest Base Camp on October 1, 2014. 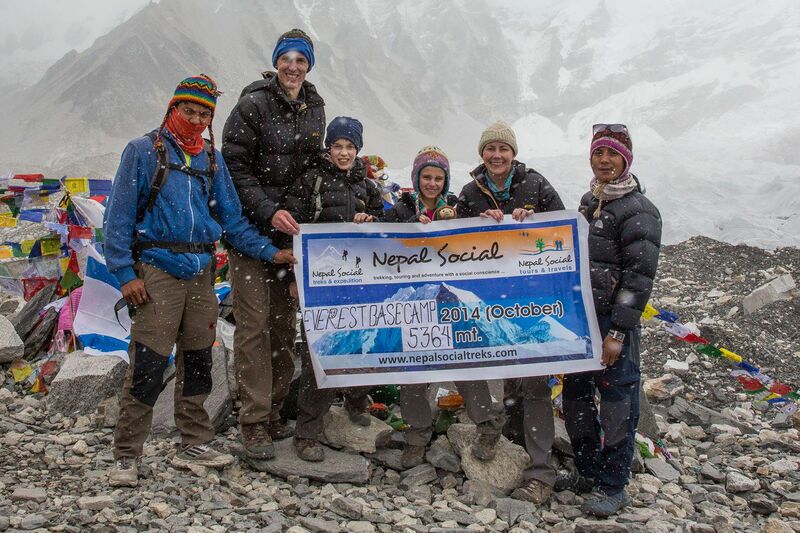 In October, very few people attempt to summit Everest. The main climbing season is April and May. 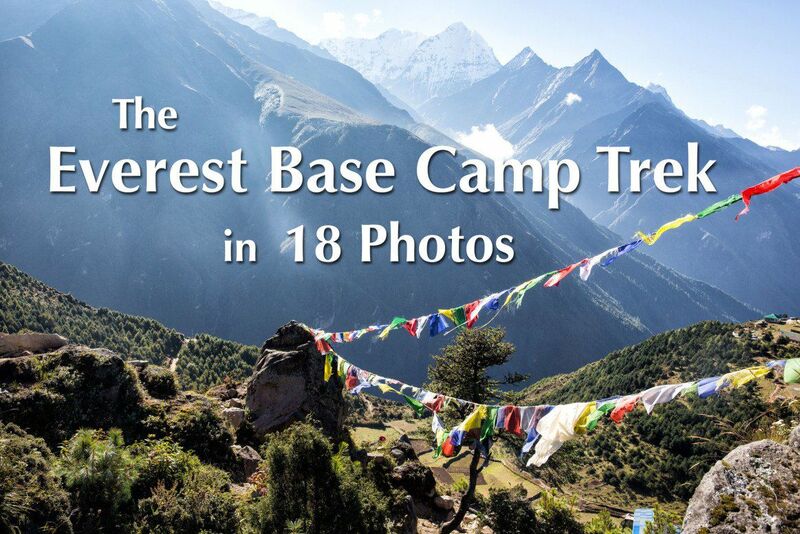 October is the most popular month for people to do the Everest Base Camp trek because of the clear weather conditions. But watch how in less than two hours we will go from blue skies to snow! We made it! What a cool moment for our family! In the photo are Indra, our guide, and our porter. And the snow that moved in extremely fast! 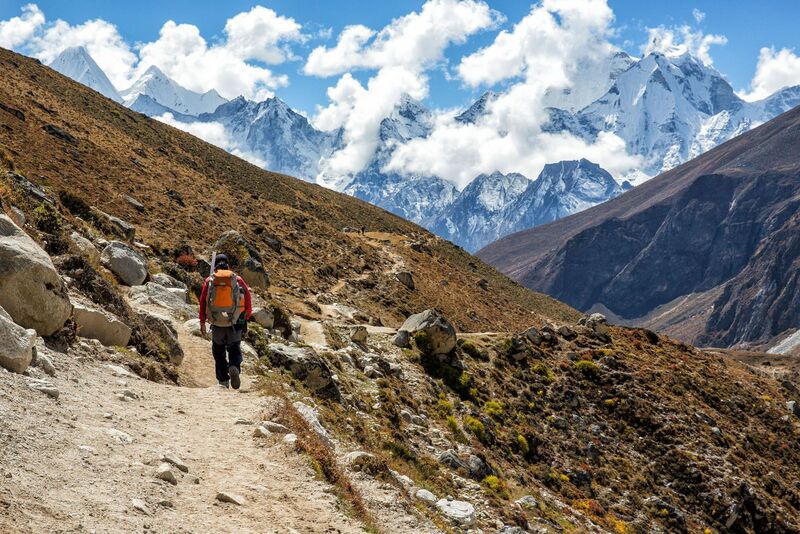 Trekking to Everest Base Camp at times feels like a never-ending slog. But days of trekking and acclimatizing pay off for the return journey to Lukla. We literally felt like we were walking on air. 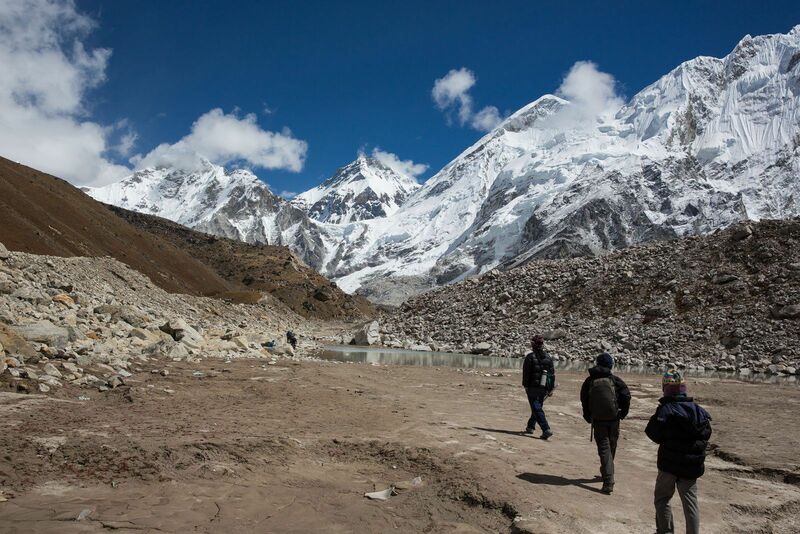 Our first day we trekked from Gorak Shep to Pangboche, 18 kilometers, and felt like we could have kept going. What was even better was that we could now enjoy those amazing views. 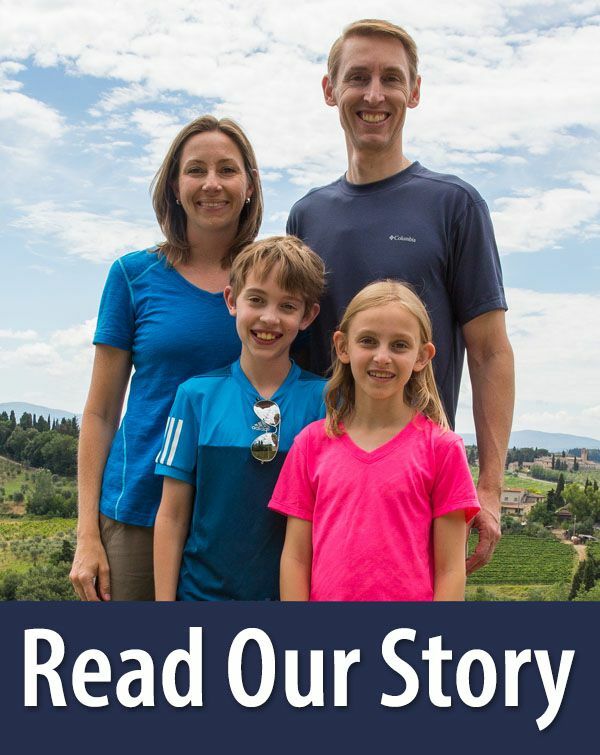 The fatigue, headaches, and general feeling of being unwell were gone. Look at this place! 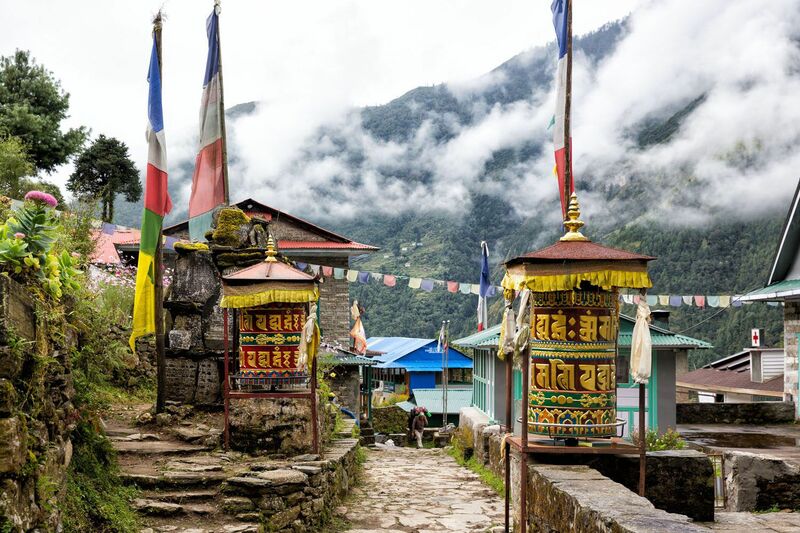 It took us eight days to trek from Lukla to Gorak Shep. It would take us three days to trek from Gorak Shep to Lukla. All of our hard work to get here had paid off. Now we could enjoy these views during the way back down. Plus, the weather was cooperating a little more, giving us crystal clear skies almost everyday. 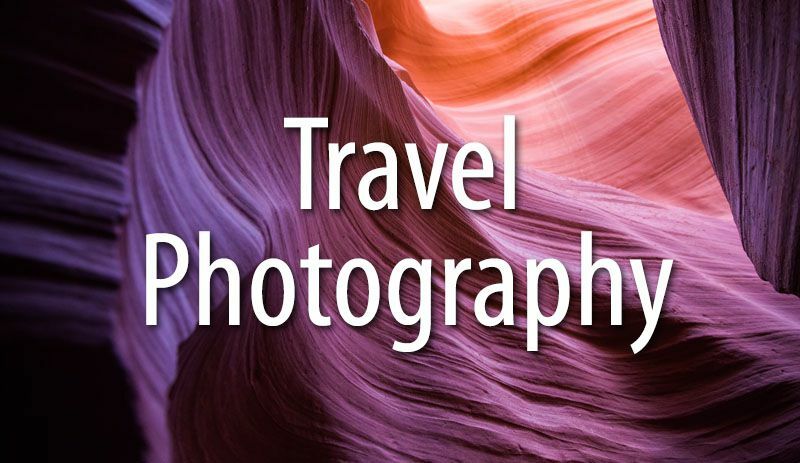 Do you have a place that you visited that was so beautiful it almost seems like a dream? 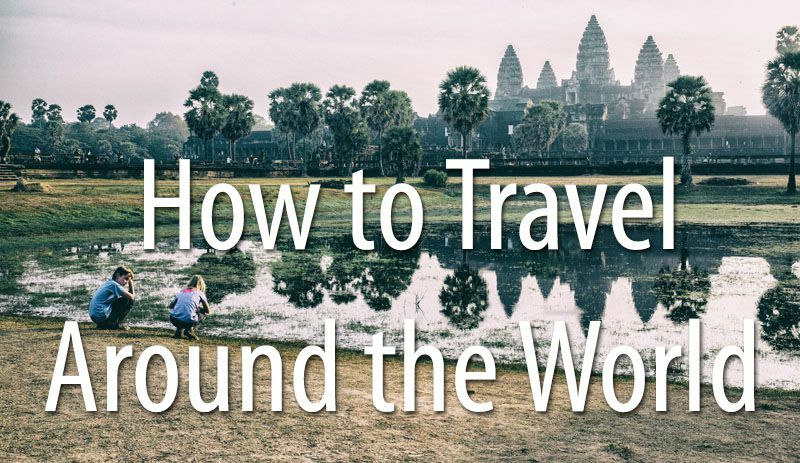 For us, it’s the Himalayas of Nepal. The special place that felt like a dream for me was Antarctica that I visited 10 days ago. Even Patagonia was a like a dream. 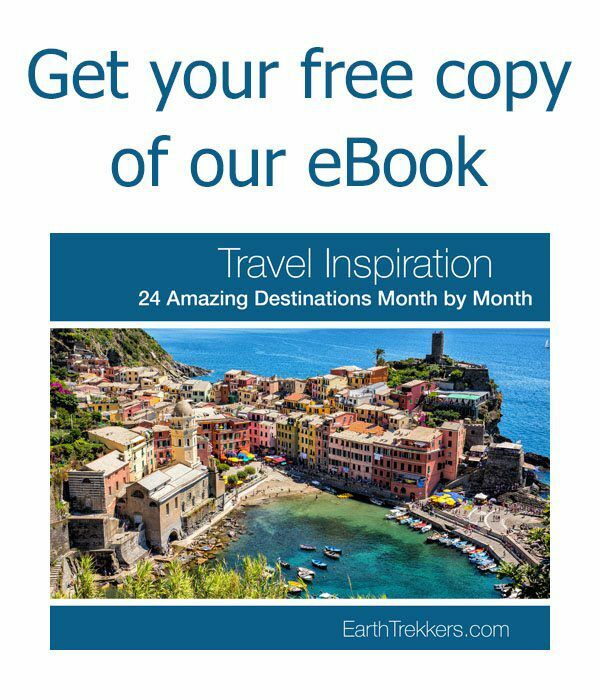 I read your post on trek to Confluencia in Aconcagua National Park. I arrived at 2:30 pm so the park ranger said I can’t go to Confluencia but take a loop with the summit view which was clouded but I loved the scenic hike. 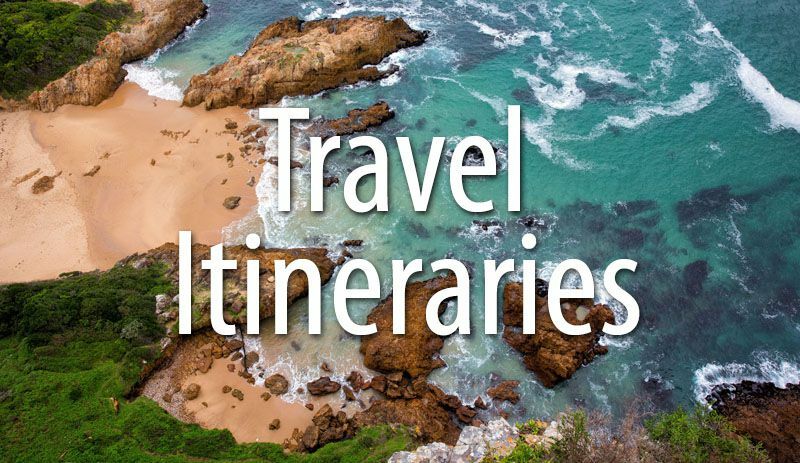 Next year I am planning for EBC which will my dream come true. 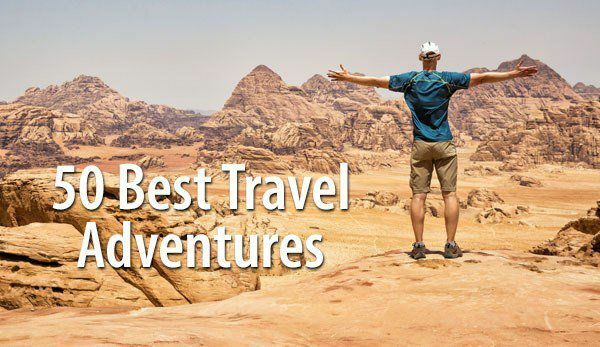 Do you reckon October as the best time for trekking here?